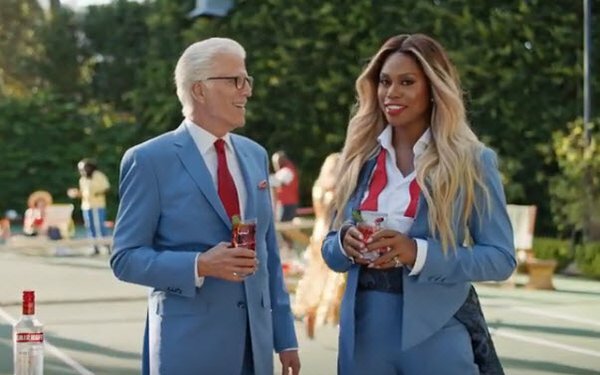 In Smirnoff’s new television and online creative, Ted Danson is back, joined by actress/author Jenna Fischer, LGBTQ TV personality Jonathan Van Ness, LGBTQ advocate and actress Laverne Cox (above) and comedian and actress Nicole Byer. Called “Welcome to the Fun%,” the campaign, from 72andSunny, “celebrates good times with a quality product that everyone can afford,” in the words of the Diageo spirits brand. “Fun%” is defined as “anyone and everyone who wants to have accessible, unpretentious fun,” and the diverse celebrities featured in eccentric, creative partying modes — with Danson’s presence as the unifying element — were selected to emphasize the inclusiveness message. While there’s a 30-second anthem version on YouTube, the multiple ads created for TV this time around are limited to 15-second format (example featuring Danson and Byer below), joined by six-second digital ads. In all, there are a dozen ads. Danson was also featured in last year’s similarly themed “Only the Best for Everyone” campaign, also from 72andSunny, which included 30- and 60-second spots. In addition to the videos, Smirnoff is rolling out a series of out-of-home ads in New York City, Chicago and Los Angeles, as well as content on the brand’s social media platforms. These ads feature “Chopped” judge/chef Amanda Freitag, Instagram and YouTube star Toddy Smith, plus-size fashion designer Gabi Gregg, and celebrity drag queen/reality TV star Alyssa Edwards drinking the vodka brand in another series of “fun and colorful” settings.